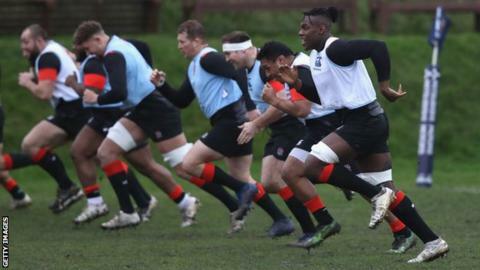 England's training schedule ahead of the Six Nations has been "changed considerably" to try to freshen up a fatigued and injury-hit squad. Eddie Jones' side are currently training in Portugal, with a number of players nursing injuries following two bruising European weekends. "We've done a mini pre-season, they won't start rugby until Thursday," said England head coach Jones. "It's in the hope it makes the players a bit fresher." Jones added: "It's how they respond [to the fatigue], and the mental part of the game is important." England face Italy in Rome on Sunday, 4 February in their Six Nations opener. There are doubts over a number of players' fitness for the game, while centre Henry Slade [shoulder] and prop Kyle Sinckler [hamstring] have both been ruled out. "Slade looks like it is three or four weeks [out], Sinckler maybe six to eight - they are still looking at," Jones told BBC 5 live. Full-Back Mike Brown, with an eye injury, and flanker Chris Robshaw, with a back complaint, also face a race against time to be fit for the clash with the Azzurri. "We think they will both be alright - Robshaw might be a bit more touch and go," added the England boss. With Robshaw and Maro Itoje nursing niggles, England have been left with only a handful of rookie back-row forwards left standing in camp. "I was watching the back-rowers train yesterday. We had four back-rowers train: Gary Graham, Sam Simmonds, Zach Mercer and Nick Isiekwe," Jones explained. "The most capped players out of those guys is Nick Isiekwe - he's 19. He's failed his driving test five times. So he can't even drive anywhere, and he's our most experienced player. "Hopefully we will get [Robshaw] back on the field, but it's a great opportunity for us to grow the team." Meanwhile Exeter wing Jack Nowell is still "three to four weeks" away from a return from an ongoing ankle issue. Forwards: Tom Curry, Charlie Ewels, Ellis Genge, Nathan Hughes, Matt Mullan, Beno Obano, Kyle Sinckler, Will Spencer, Chris Robshaw, Billy Vunipola. Hear from Eddie Jones and a host of Six Nations coaches and captains on the Rugby Union Weekly Six Nations special, 5 live Sport on Thursday at 2030.